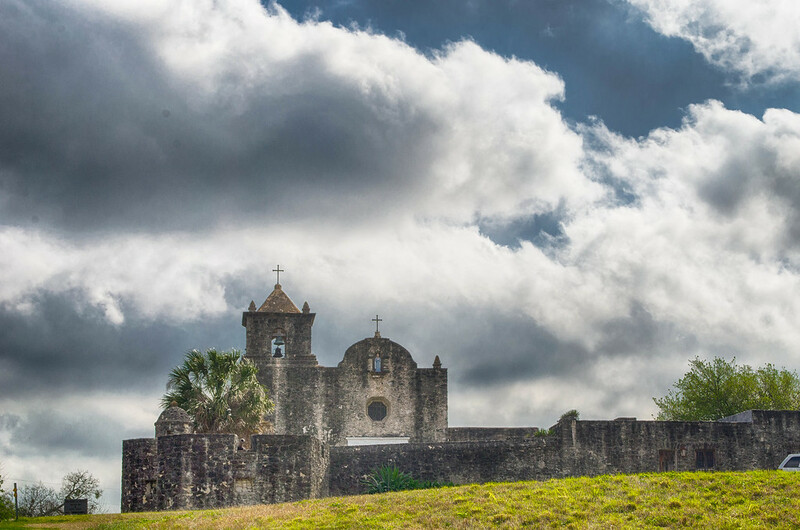 You Have Heard Of The Alamo But What About Goliad? 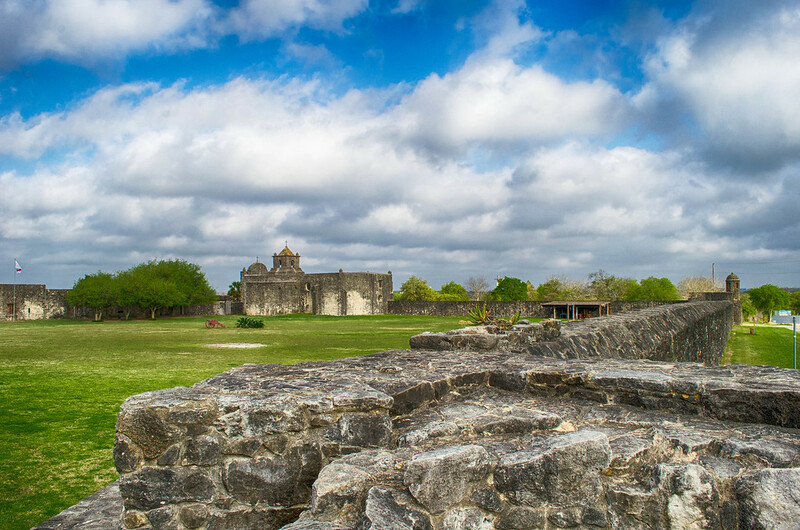 Home » You Have Heard Of The Alamo But What About Goliad? 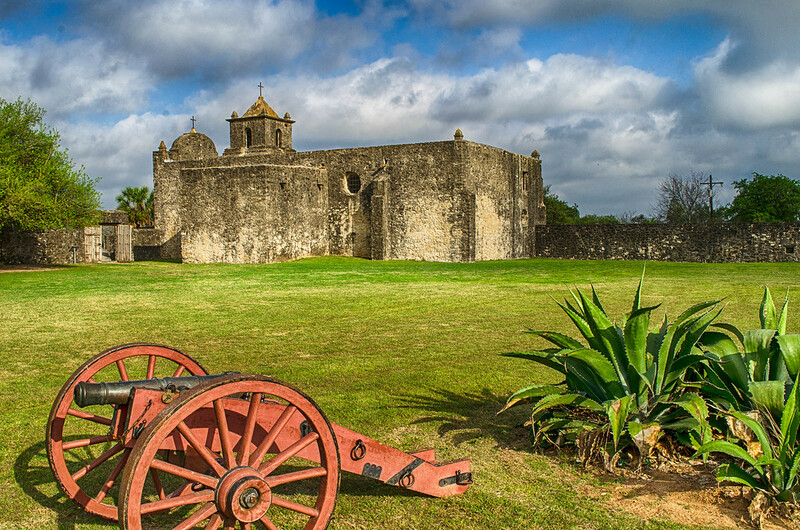 Everybody remembers The Alamo but few outside of Texas know about Goliad. 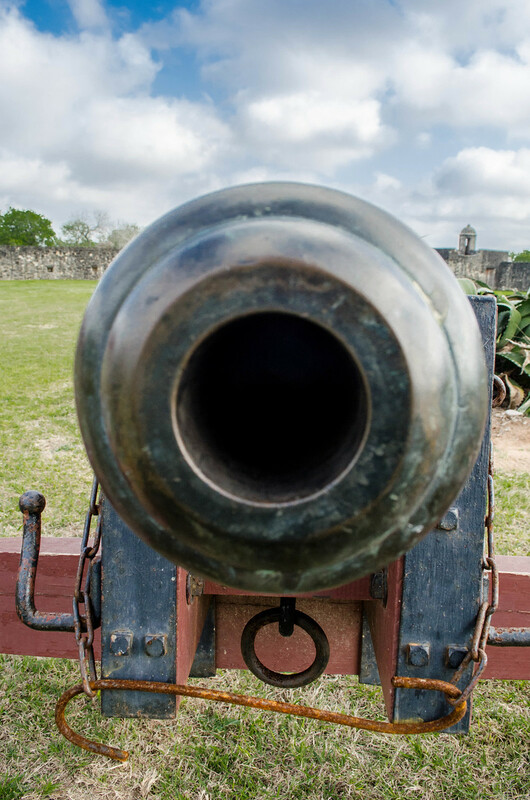 Some might say that Goliad had as much or more to do with the fight for Texas independence as did The Alamo. In 1749 the Spanish relocated a Mission and a Presidio to the Northern frontier of its North American colonies. 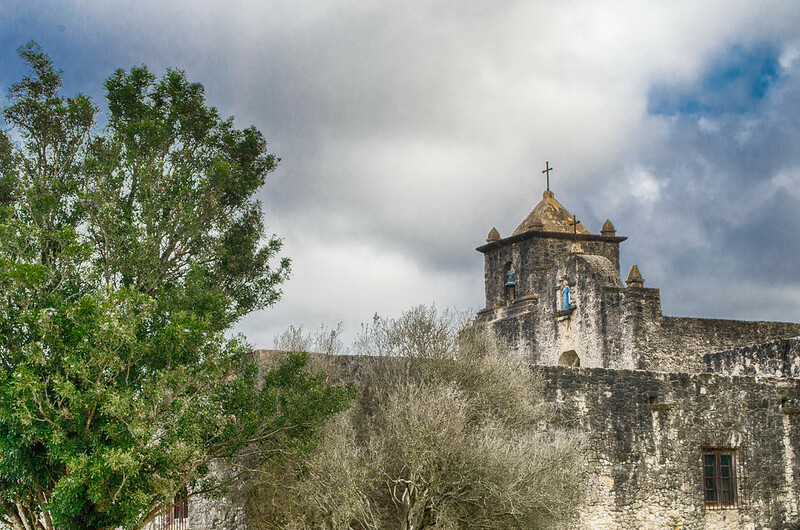 Located on the banks of the San Antonio River, the mission and Presidio were meant to attract settlers to the area. 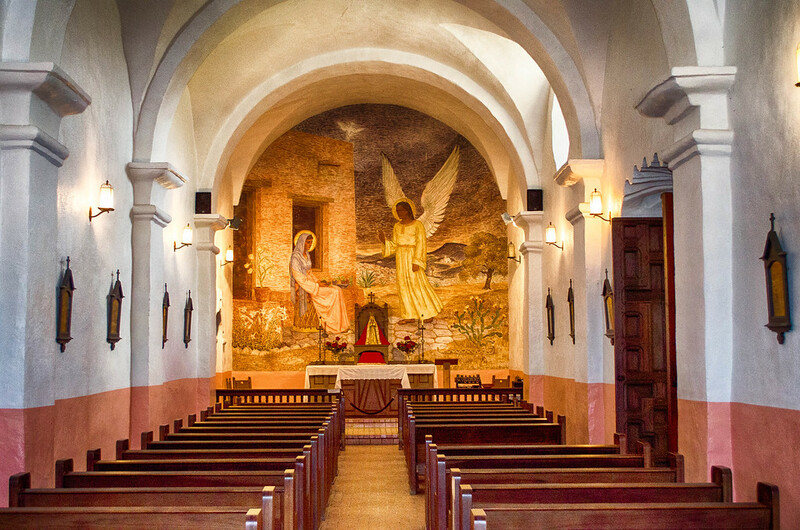 The Mission Nuestra Señora del Espíritu Santo de Zúñiga was established by the Spanish Crown and the Catholic Church as a way of civilizing and Christianizing the native Karankawa, Aranama and Tamique people and make them Spanish citizens. The native tribes agreed to move into the Mission in exchange for protection, food and shelter and as a result the gradual erosion and eventual destruction of their tribal cultures occurred. The Mission remained active until 1830 when declining native tribe populations, lack of money and political turmoil in Mexico forced it to close. From 1848 to 1856 the city of Goliad leased the area and it was used as a school. Over the years some of the stones from the Mission were used by residents of Goliad for building and the site fell into disarray. In 1931 the site came under control of the State of Texas Park system and reconstruction began. Over several years, the site was brought back to the way it was in 1749. Some of the original structure is still in place and can be seen while touring the area. In 1977 the site was placed on the National Register of Historic Places. At the same time the Mission was relocated, so was the Presidio La Bahia. 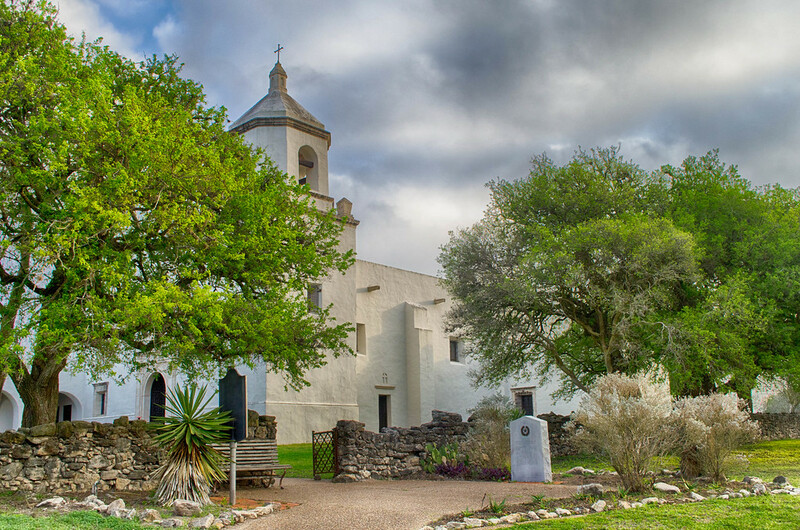 Throughout the Spanish colonial period the Presidio protected the nearby Mission as well as the Texas coastline. The La Bahia played a major role as a fort and was the main military post between San Antonio and the Rio Grande. Originally the Presidio had wooden buildings and grass huts but they were replaced by stone buildings, quarters for the troops and a stone wall surrounding the compound with rounded limestone bastions to mount cannon, an arsenal, and the Presidio chapel. 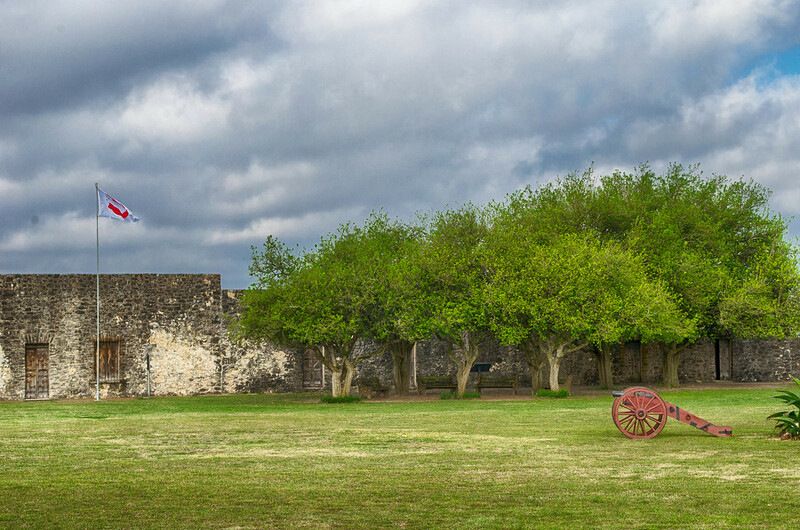 In later years, the Presidio La Bahia would play an important part in Texas Independence. The Presidio was the site of several battles over the years and Spanish, Mexican, militia units and others occupied the fort at one time or another. Soon after Texas won independence in 1836 the Presidio was abandoned. For a while it was the property of a local judge, who used the chapel as a residence. In 1853 the Catholic Church once again became the owner of the chapel. The surrounding Presidio fell into disrepair until 1963 when a massive restoration effort began to document the site’s remains, and reconstruct many of the Presidio’s former buildings. In 1967 the walls and many of the buildings along with the bastions, had been returned to their 1836 appearance. The Presidio is both a State and National Historic Landmark and today the Presidio La Bahia is open to visitors, you can even stay the night in the guest quarters. 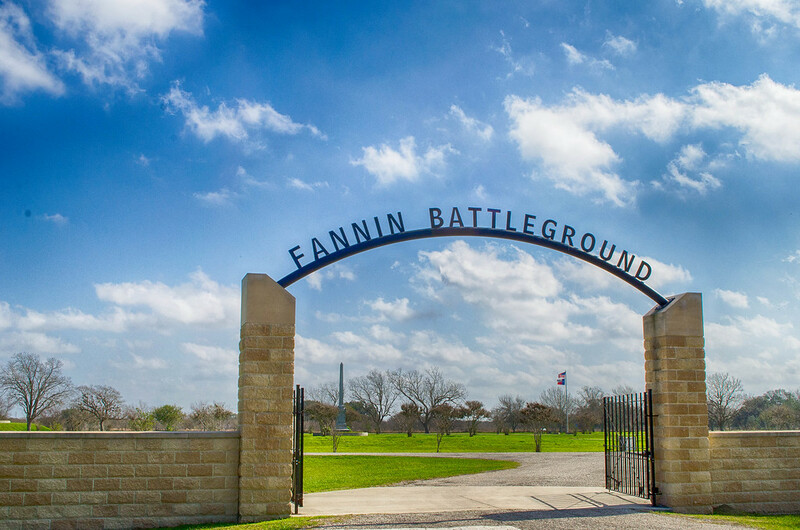 About seven miles east of Goliad, just off Hwy 59, lies the Fannin Battleground. During the war for Texan Independence, Colonel James Fannin arrived at the port town of Copano with four companies of the Georgia Battalion. Hearing of the plight of the defenders of the Alamo, Fannin responded for help and set out on a 90 mile journey to San Antonio with several hundred men, four cannon, spare muskets and supplies. On March 19, 1836 Fannin set out but only made it seven miles before being confronted by Mexican cavalry. A battle, also known as the Battle of Coleto Creek, ensued and the Mexican forces lost between 200-300 men while Fannin lost seven to nine with sixty wounded. Facing increasing Mexican troops and laden with supplies and broken down wagons, Fannin surrendered the next day after being reassured his men would be treated as prisoners of war. Some were saved by the “Angel of Goliad“, a lady of Mexican birth named Francita, Francisca, Panchita, or Pancheta/Panchita with surname Alavez, Alvarez, or Alevesco. 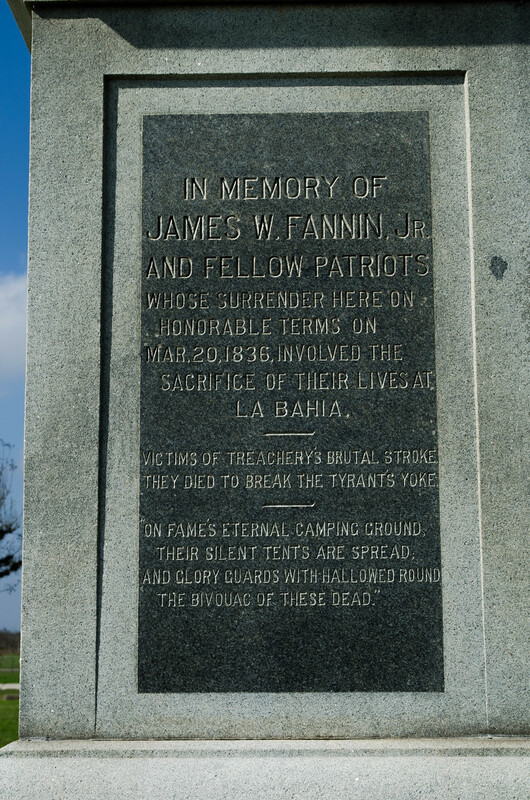 Fannin and his men are buried just outside the Presidio La Bahia and a monument was erected in 1936. 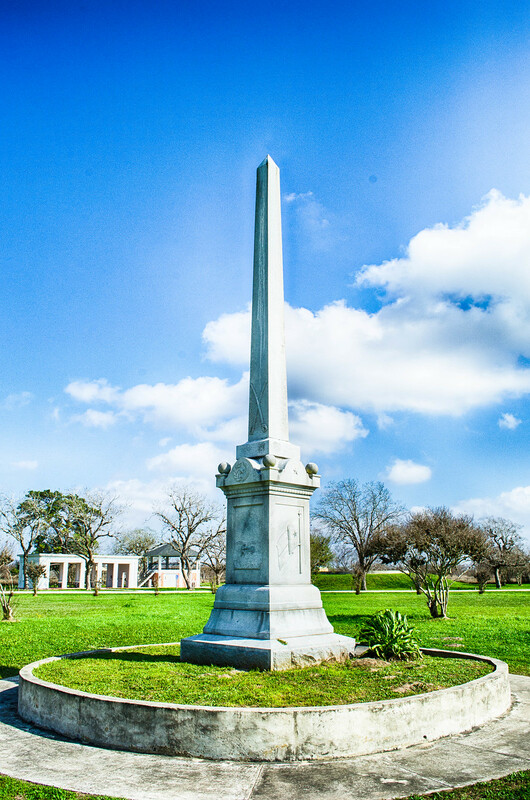 After the Goliad Massacre, as it was later called, battles would hear the cry of “Remember the Alamo” and “Remember Goliad”. While the defenders of the Alamo died in battle, Fannin and his men were massacred after surrendering and being given reassurances they would be treated as prisoners of war. Today Goliad is a town centered around ranching and farming, with a population of around 2,000. The County Courthouse sits on the town square where market days are held once a month and you can stop by and look at the Hanging Tree. 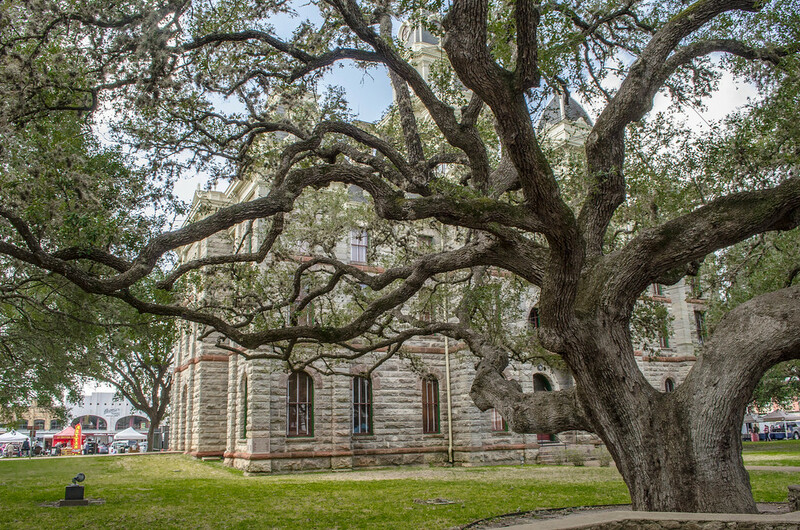 For twenty-four years, court was held under this large oak tree and sentences were carried out on the spot. Estimates are the hangings numbered in the low hundreds. 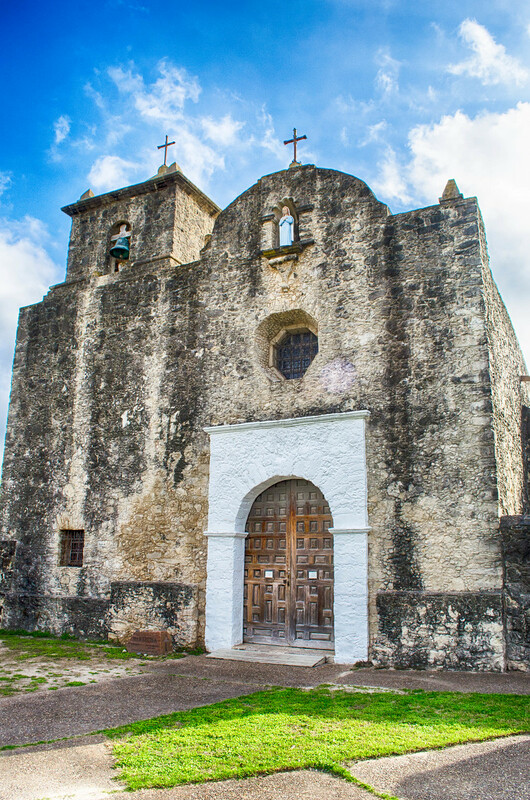 You won’t get hung in Goliad today but you can step back into history and learn about Spanish colonial Texas and Texas Independence. Goliad is located at the intersection of Hwy 59 and Hwy 183, 154 miles southwest of Houston and 91 miles southeast of San Antonio. Looking to getaway? These guys have great deals on some fantastic destinations. 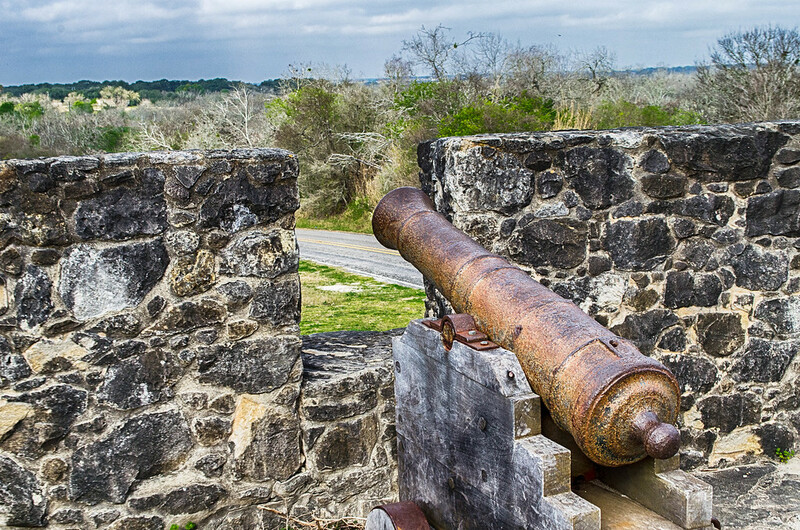 I never heard of Goliad before, but it is a fascinating story. 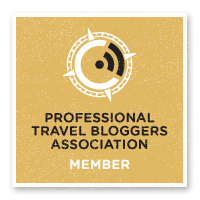 Your passion for history really comes through in your blog post. Great article. My wife and I just busted San Antonio for the first time and loved learning the history of the Alamo. This adds a lot to the story, we’ll have to go back! Goliad is about 90 miles from San Antonio, would make for a nice day trip. A fascinating story, not to mention an incredibly sad and sickening one. A very real atrocity here, sadly not the only one I’ve read about in History. It looks like a really fascinating and evocative place to visit. Thanks for shedding light on a little-known chapter of US history! Goliad is a small town but full of history. Well worth the visit. Goliad is news to me, but such a sad story! 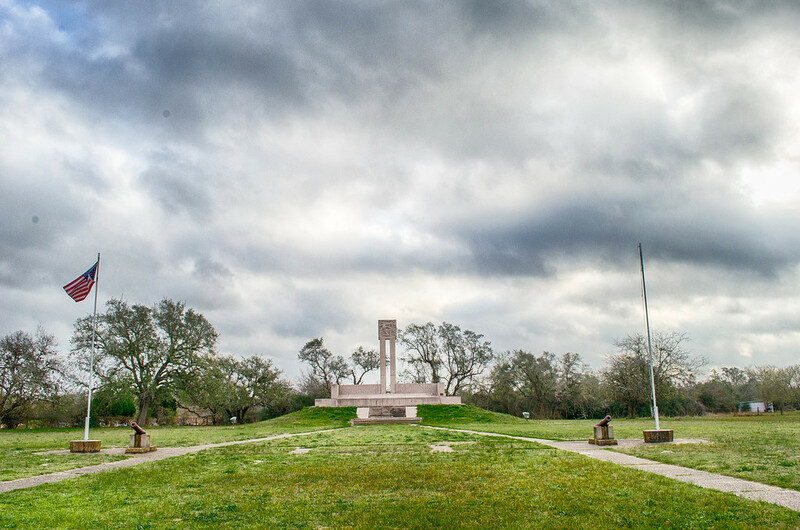 These sites look like great places to explore and learn more about the history of our country and especially Texas. I’m always fascinated by the sacrifices of those who fought for what we take for granted today. It’s an interesting part of Texas History. I have never heard of Goliad – it sounds like a name from medieval England. What a cool historic place. Sounds well worth the visit – thanks for sharing! I always love reading your blog. Definitely a place to visit for those people travelling nearby. A beautiful site too. Thanks for the kind words. I’m glad you enjoyed the post. What a beautiful place and an incredible back story! Well worth the visit if you are ever near there. I’ve been to the Alamo but obviously, there are so many more places in Texas to visit! I lived in El Paso for three years when I was younger and despite the fact my family explored a lot, we missed all these spots! 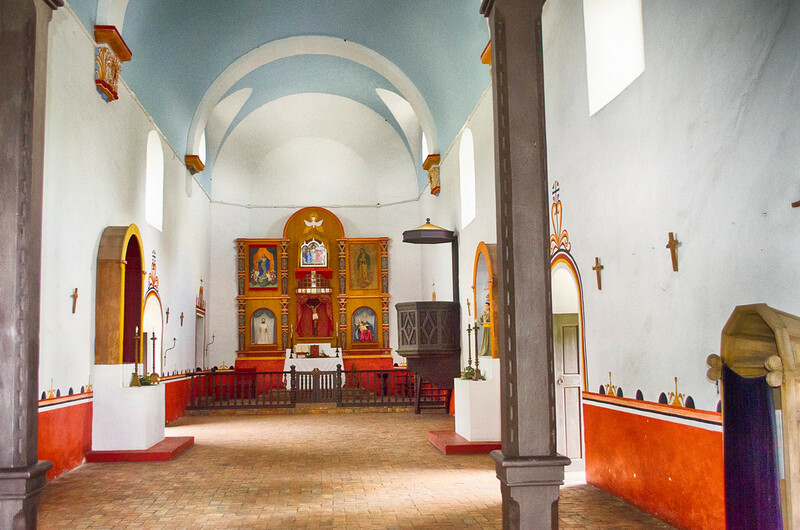 I live the vibrant colors inside the Mission Espíritu Santo. Some of the best historical sites are kind of off the beaten path in small towns around the state. Goliad is one of them. Not being from the US I have never heard of Goliad. Fascinating read and I’m sure a night in that guest house would be an unusual stay. Definitely a different venue and one you would remember staying at. I am not that familiar with the Alamo and the fight for Texas independence. Thanks for retelling some of that history. Goliad and the buildings are beautifully restored. I’ve never heard of Goliad. Thanks for the history lesson. The most fascinating fact is about the Presidio being abandoned and a local judge deciding to take up residence in its chapel. What an amazing home that must’ve been. It would also be interesting to stay the night there. Quiet with maybe a few long lost spirits wandering around at night. Interesting history. 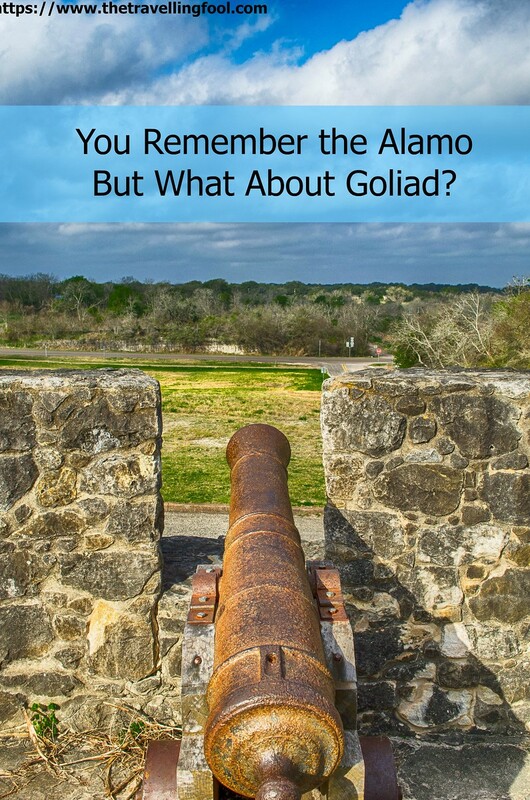 It’s always fascinating to speculate on things like why “Remember the Alamo” is still familiar today (due in part to a certain Pee-Wee Herman movie 🙂 ) while “Remember Goliad,” and the place and events that OTHER battle cry refers to, have largely been forgotten, at least outside of Texas. I had never heard of Goliad before reading this post.Those hanging trees, which I’ve seen in other southern cities, are spooky, BTW. Courthouse Justice in days gone by. Great glimpse into this fascinating place and your pictures are so dramatic! You can almost hear the cannons of war, the voices of the past. I love Texas and the towns spread so far apart but full of fascinating architecture, history and great food! Thanks for the kind words. 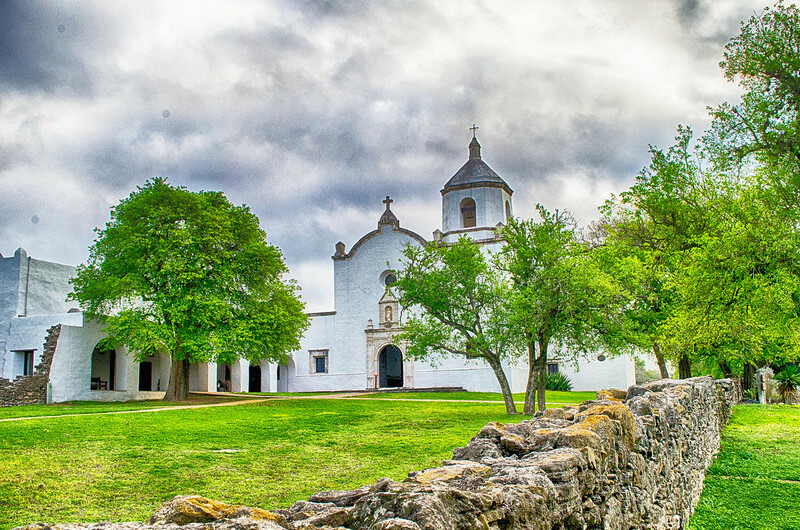 Goliad is often overlooked since it isn’t really near a large city but it is well worth the visit. My husband and I went to San Antonio last year and had never heard of Goliad. I’m always learning something interesting about Texas history, like what you’ve told here. It is a tragic story. I’ll make sure we visit next time we’re in the area. It’s not that well known outside of Texas. The Architectures everywhere are great and I love your photos. Goliad is indeed beautiful. Thanks for sharing. What a beautiful place you visit in this post. I like it. So stunning pics. Thanks for sharing it. Great places and pictures…. Goliad is indeed beautiful. Thanks for sharing it. These places all look gorgeous! Awesome list you shared with us. fascinating beauty and incredible nature. Thanks for sharing it. Great, that is an awesome place and it is full with beautiful things. i really like beauty of that place and so stunning photos you captured of that awesome place.